Low-Carb Slow Cooker Sweet and Sour Pot Roast is one of my favorites and this is a delicious low-carb dinner from the slow cooker! 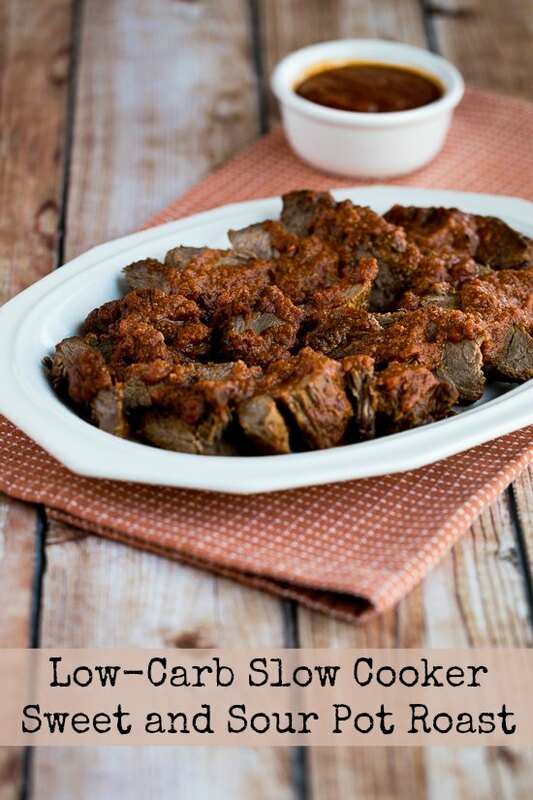 Click here for 50 Great Low-Carb Slow Cooker Dinners! Click here to see 50 AMAZING Low-Carb Instant Pot Dinners! Isn’t pot roast just about the quintessential slow cooker dish? I think it’s pretty hard to make a bad pot roast in the slow cooker, but what really makes this Low-Carb Slow Cooker Sweet and Sour Pot Roast different from all the other beef pot roast recipes is the sauce, of course. Asian flavors like garlic, ginger, soy sauce, rice vinegar, and even anchovy paste (optional) combine with tomatoes and onion to make a delicious sauce that would be great over rice or noodles, or serve over cauliflower rice for a low-carb meal. Get the complete recipe for Low-Carb Slow Cooker Sweet and Sour Pot Roast from Kalyn’s Kitchen. Use the Index Page for From Kalyn’s Kitchen to see my other favorites that have been featured on this site. Before recipes like this one on your blog and here on Slow Cooker from Scratch, I really never made a great pot roast. Who knew the slow cooker was just the tool I needed? Thanks for linking to one of my own slow cooker recipes. Lydia, my pleasure. And I agree that the slow cooker is perfect for pot roast! Hi Kalyn, I love your recipes! The step by step and pictures are so helpful. Such a wonderful job! How would I convert your crockpot recipes for my instapot? I am slowly experimenting with my favorite slow cooker recipes, trying them out in the Instant Pot. 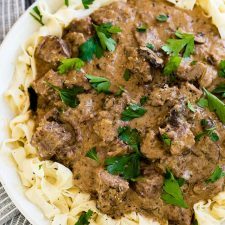 But I’m afraid I’m not experienced enough with the Instant Pot to give an easy formula for converting any slow cooker recipe to an Instant Pot recipe. When I googled it, I found lots of posts on converting slow cooker –> pressure cooker, but the advice wasn’t consistent, so I am hesitant to recommend one. On this site if you enter “slow cooker or Instant Pot” or “slow cooker or pressure cooker” into the search bar, you would see all the recipes (including ones from Kalyn’s Kitchen) where there are tips for both cooking methods. Hope that helps!